The powerful tornado passed through the Cuban capital of Havana, leaving severe damage to the city. 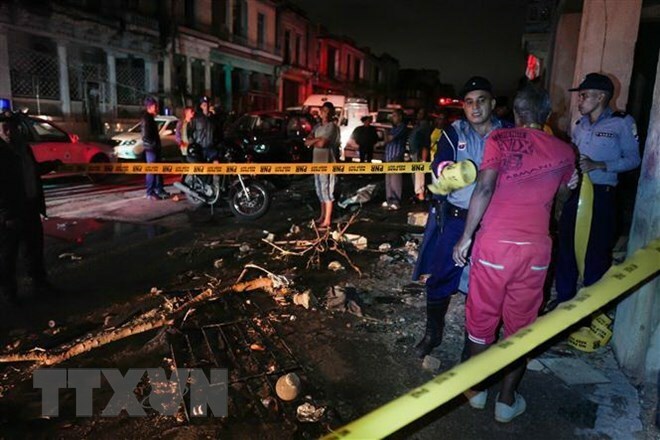 The powerful tornado passed through the Cuban capital of Havana on January 27, killing at least three people and left 172 injured. It also caused severe damage to the city’s infrastructure. In an interview with the Vietnam News Agency, Nghi noted that by the end of 2018, Vietnam hosted about 3,000 projects invested by OVs in 45 cities and provinces, with total investment of nearly 4 billion USD. Statistics from the World Bank showed that in 2018, OVs sent home 15.9 billion USD, about 60 percent of which was poured into business and production, he said. Nghi said that during the year, the country saw the return of a large number of intellectuals and scientists, especially young ones. 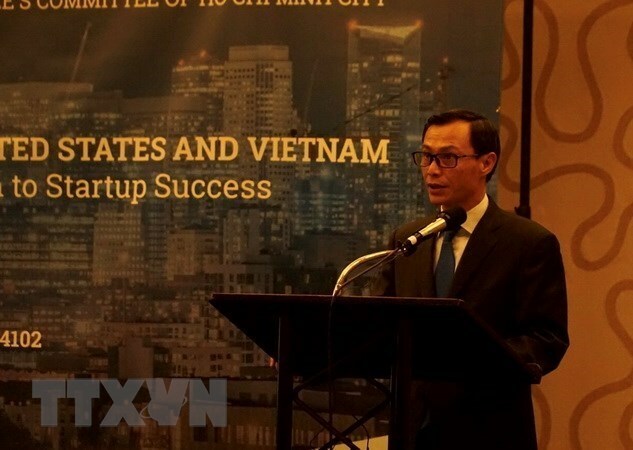 A number of activities were held to lure OVs’ engagement in business and research at home, including a forum to connect Vietnamese startups in June 2018, gathering a large number of startup firms at home and abroad. An initiative on Vietnam innovative network was launched in the year with the participation of more than 100 young Vietnamese scientists around the world who gave many ideas and strategies for Vietnam to successfully build the development strategy for the Fourth Industrial Revolution in the future, he said. About 250 initiatives and proposals were given at the first Vietnamese Young Intellectual Forum in Da Nang in November 2018. Meanwhile, more than 200 OVs from 23 countries and territories gathered at a conference in late 2018, contributing many ideas for localities to improve their investment and business environment, promoting their potentials in economy and tourism, stated Nghi. The event was followed with the signing of many cooperation agreements, he said, adding that an OV from Germany received a licence to build a 10 million USD factory in Ha Tinh province. Nghi underscored that to further promote brainpower resources from the 4.5 million-strong Vietnamese community abroad, it is necessary to make changes in policy to attract expat scientists. It is estimated that about 500,000 OVs are working in research institutes abroad, with 300 of them regularly cooperating with organizations and localities at home, he noted, pointing to the need to optimize their potential by creating a flexible environment for them to make more contributions. Nghi said that in the coming time, the State Committee for Overseas Vietnamese Affairs will coordinate with the Vietnamese communities in different countries to seek proper measures to strengthen connectivity activities. Meanwhile, the committee will support the Vietnamese associations abroad in line with local law, he said. Prime Minister Nguyen Xuan Phuc inspected the combat readiness work of Division 372 under the Air Defence – Air Force Service on February 4, or the last day of the Year of the Dog. 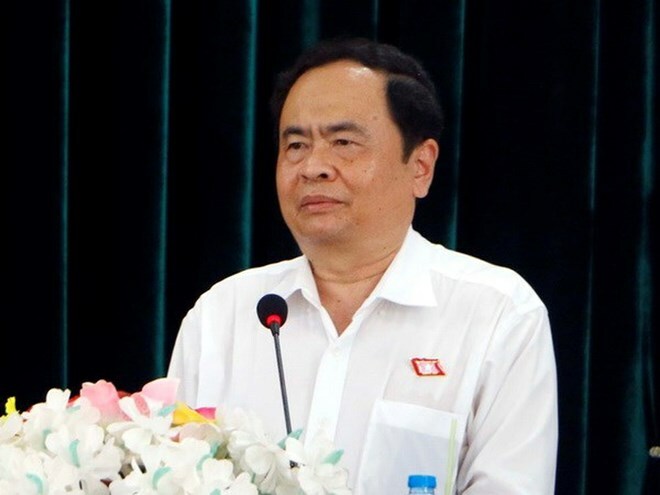 The Vietnam Fatherland Front (VFF) will work harder to continue performing well its role as a bridge between the Party and the State and people and the common house of the national great unity bloc, said President of the VFF Central Committee Tran Thanh Man. 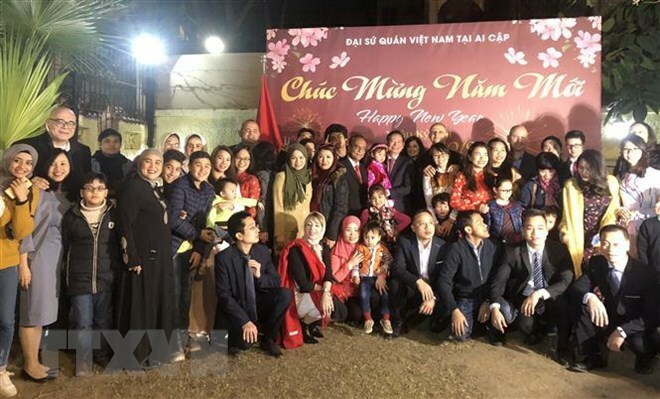 In 2019, the organization of the 9th National Congress for the 2019-2024 tenure will be the prime task of the VFF, Man said in an interview granted to the media on the occasion of the Lunar New Year (Tet) holiday. He said the VFF chapters at all levels will continue reforming communications methods and proactively working with local administrations in providing information for the public to miminize the occurrence of pressing and complicated issues. They will focus on carrying out productively the VFF-initiated campaigns, especially the campaign “the entire people unite to build new rural areas and civilized urban areas”. The VFF will expand the national great unity bloc by working closely with the whole political system to translate into deeds the viewpoints, guidance and policies of the Party and State on the bloc and harmonizing the common interests of all social strata, he noted. 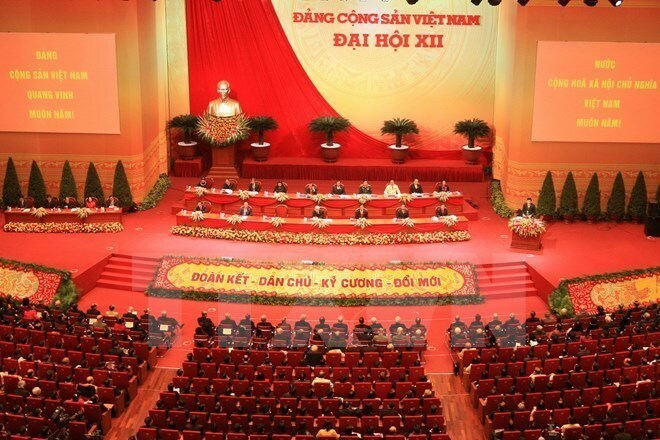 It will continue working to gather synergy of Vietnamese in and outside the country towards the goal of building the country of peace, independence, unity, and territorial integrity so the people will be wealthy while the nation is strong with democracy, justice, and civilization, the official said. Promoting democracy and maintaining disciplines in society will contribute to consolidating the national great unity bloc, he said. The front and its organization members must work as a “firm bridge” between the people and the Party and the State so the people can proactively contribute their opinions and engage in discussing important issues of the country, he said. The VFF chapters at all level will proactively coordinate with local administrations to tackle legitimate pressing issues lodged by people, along with taking part in fine-tuning the legal system to ensure people deliver their aspirations via mass organizations and the VFF. They will work to promote the people’s role in building a strong Party and administration, create a consensus in society, and help people believe in the Party’s led reform for the country’s development. The VFF chapters will boost their role in supervising and giving social feedback to achieve social stability for the country to grow comprehensively and sustainably, and in encouraging officials, Party members, and people to actively participate in fighting corruption and wastefulness. Vietnamese people always show solidarity and stand side by side with Venezuelans, the Vietnam-Venezuelan Friendship Association has affirmed. The association asserted that Vietnamese people always stand side by side and promote solidarity with Venezuelans as well as support the country’s sovereignty, national independence and self-determination in accordance with the fundamental principles of international law and the United Nations Charter. Vietnamese people pledged to accompany Venezuelans to foster the two nations’ friendship and promote the bilateral multi-faceted collaboration, contributing to peace, cooperation and development in the two regions and beyond, the association said. 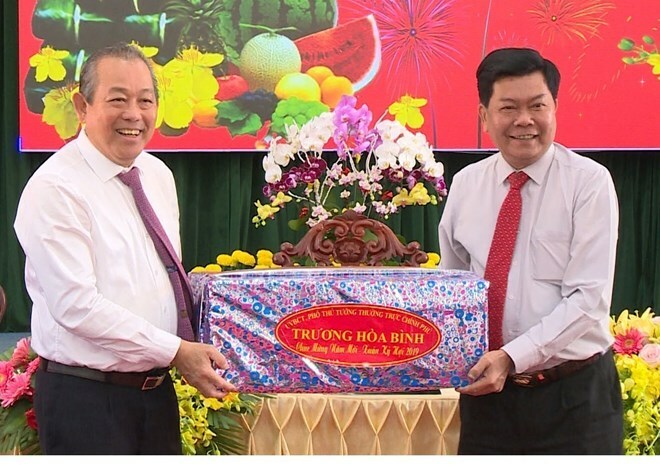 Permanent Deputy Prime Minister Truong Hoa Binh (L) presents Tet gift to Long An authority and people. The ruling party of Cambodia spoke highly of the development of the solidarity, traditional friendship and comprehensive cooperation between the two Parties, States, Governments and people of Cambodia and Vietnam, showing its determination to continuously reinforce and promote the bilateral ties towards the motto of “good neighbourliness, traditional friendship, and comprehensive and lasting co-operation”. A representative of the group pledged to create favourable conditions for the Vietnamese workers to work more safely and efficiently and to improve their living conditions. 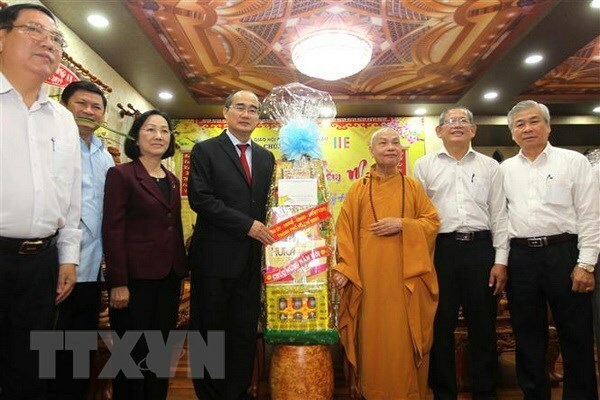 Politburo member, Secretary of the HCM City Party Committee Nguyen Thien Nhan pays pre-Tet visit to local religious establishments and dignitaries. 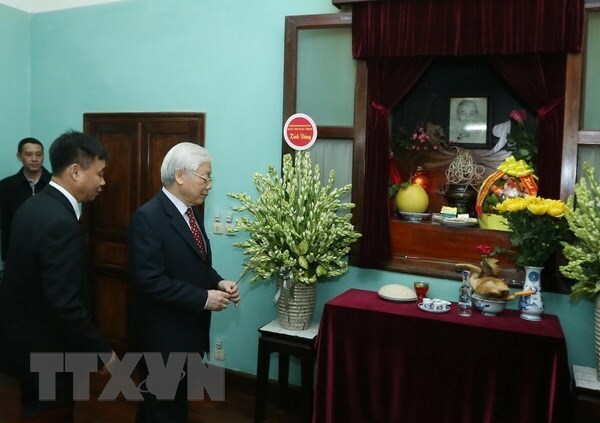 Politburo member Nguyen Thien Nhan, who is also Secretary of the Ho Chi Minh City Party Committee, on February 2 visited various religious establishments and dignitaries in the city on the occasion of the upcoming traditional lunar New Year (Tet). Visiting Most Venerable Thich Tri Quang at Hue Nghiem Pagoda in District 2, Nhan spoke highly of the monk’s contributions to the development of Buddhism in the country in general and the city in particular. He wished the dignitary good health and continued contributions to the further development of the religion. 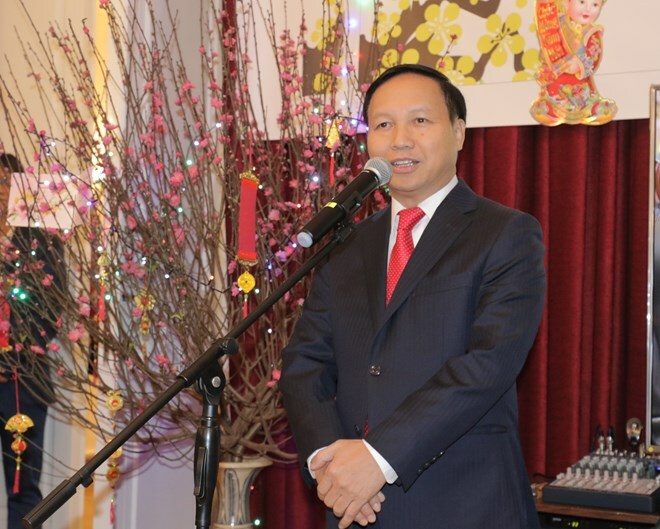 For his part, Thich Tri Quang praised the city’s achievements over the recent past and expressed his belilef that in the new year, the city will reap further achievements. The same day, Nhan visited supportless old people who are being taken care of at a church in Thu Thiem (District 2). He highly valued the social activities of the church and stressed that it has done well the charity work. Before that, the official visited the Thu Thiem Church, where he extended warm regards to Parish Priest Le Dang Niem and spoke highly of his work in easing the difficulties of the poor. Also on February 2, Nhan visited and extended Tet greetings to representatives of the Party Committee, administration and locals of Nha Be district, asking them to accelerate the administrative reform and to focus efforts on the national programme of building new-style rural area in the locality. Politburo member Tran Quoc Vuong delivers Tet greetings to soldiers and people in Son La province. The same day, the official had a meeting with representatives of the local administration and people, during which he spoke highly of their process over the recent years. He also reminded them to continue doing well the party building work, anti-corruption fight and that against crimes, especially those related to drug. The gifts were presented to 100 social policy beneficiaries and poor households in the two districts, and 40 disadvantaged students with outstanding academic performance in Thap Muoi district as the country’s biggest traditional lunar New Year festival is approaching. 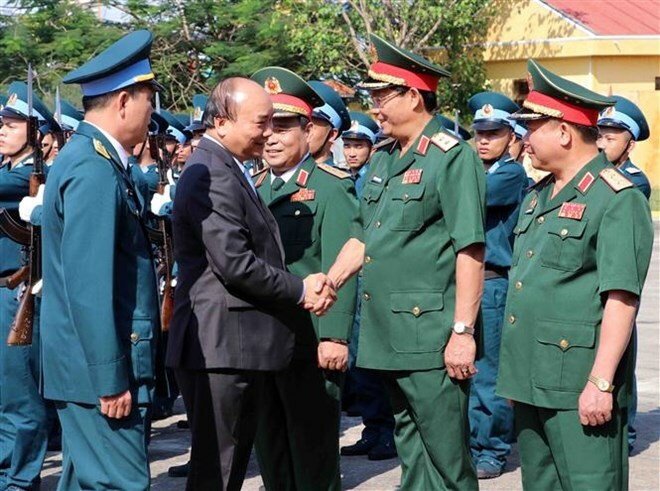 On the occasion, Binh also visited and extended New Year wishes to officers and soldiers of the provincial Military Command and Border Guard Command. 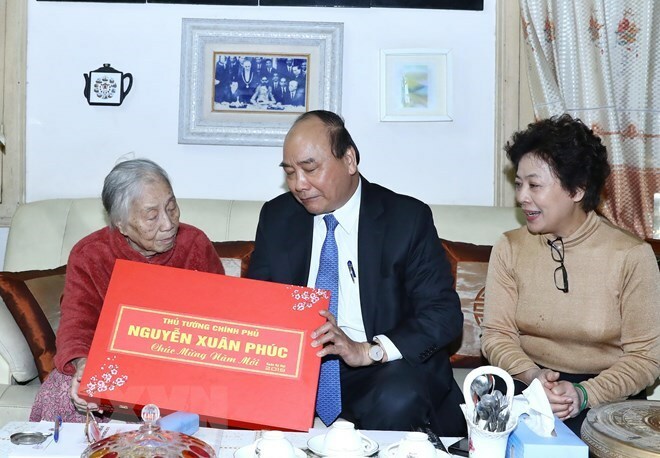 Meanwhile, the central province of Thua Thien – Hue handed over nearly 250,000 New Year gifts worth 59.7 billion VND (2.5 million USD) to social policy beneficiaries, up over 7 billion VND from the previous Tet festival. Specifically, more than 28,900 gifts worth over 5.4 billion VND granted by the State President and other gifts funded by the provincial budget valued at 851 million VND reached their hands. Districts and communes granted 845 gift packs worth 388 million VND, apart from over 9,700 gift packs worth 1.8 billion VND presented by wards and townships. 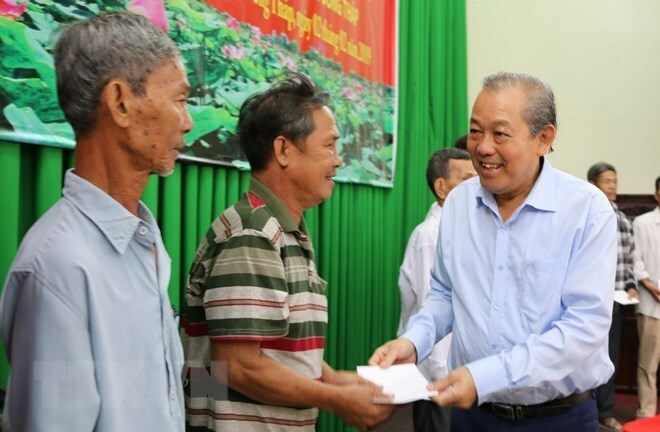 The provincial authorities offered gifts to more than 201,000 poor and beneficiary households with a total value of over 51.2 billion VND sourced from the local budget, the Vietnam Fatherland Front chapter, mass organisations and businesses. The Agribank branch in Thua Thien-Hue also handed over 50 gifts, each worth 1 million VND to poor families and social policy beneficiaries in A Ngo commune, A Luoi district. 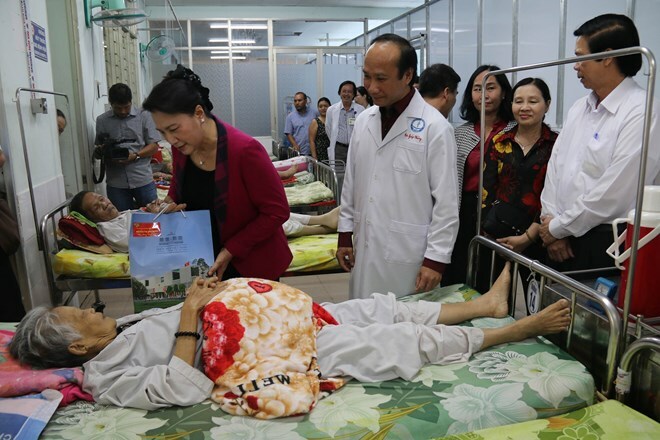 Last year, the branch spent about 2 billion VND on ambulance cars as gifts to the Hue Central Hospital, bought cows in support of poor households in Hong Thai commune, A Luoi district and built 7 houses of gratitude for local families living in need. Prime Minister Nguyen Xuan Phuc offers incense to President Ho Chi Minh. Prime Minister Nguyen Xuan Phuc visits former Vice President Nguyen Thi Binh. 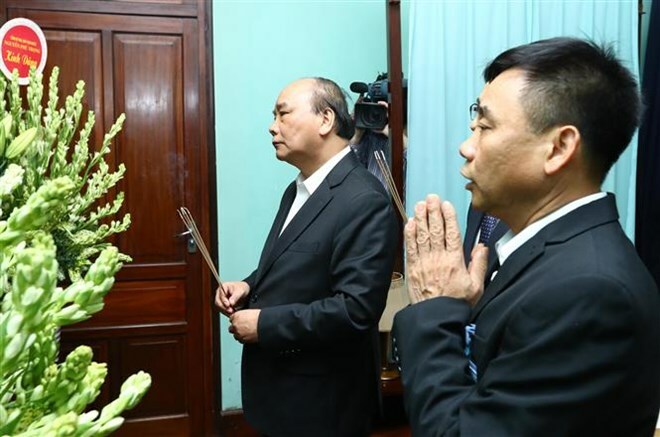 Prime Minister Nguyen Xuan Phuc on January 1 visited former President Le Duc Anh and former Vice President Nguyen Thi Binh in Hanoi on the occasion of the coming traditional lunar New Year. He was accompanied by Politburo members Truong Hoa Binh, Permanent Deputy Prime Minister; and Pham Minh Chinh, head of the Party Central Committee’s Commission on Organization. Visiting Anh, the PM extended his best regards to the former President and stressed that the talented General, who experienced various resistance wars, had made special and important contributions to the liberation of the Cambodian from the genocidal tragedy 40 years ago. 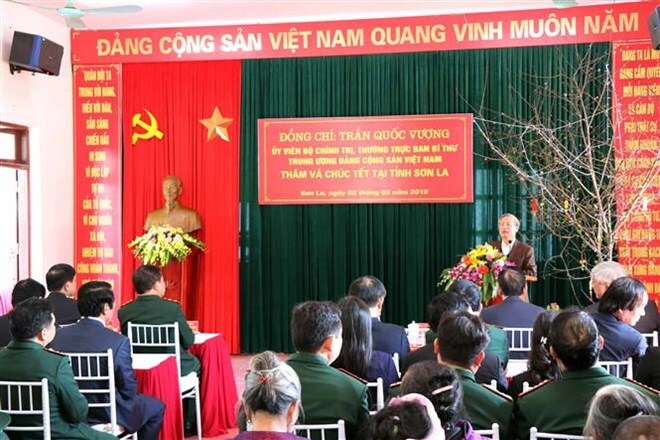 During the visit to Binh, the Government leader recalled her great contributions when she was serving as the Foreign Minister of the Provisional Revolutionary Government of the Republic of the South of Vietnam and head of its negotiation delegation in Paris on Vietnam from 1969 to 1973. PM Phuc wished both of them good health and further contributions to the national construction and development. 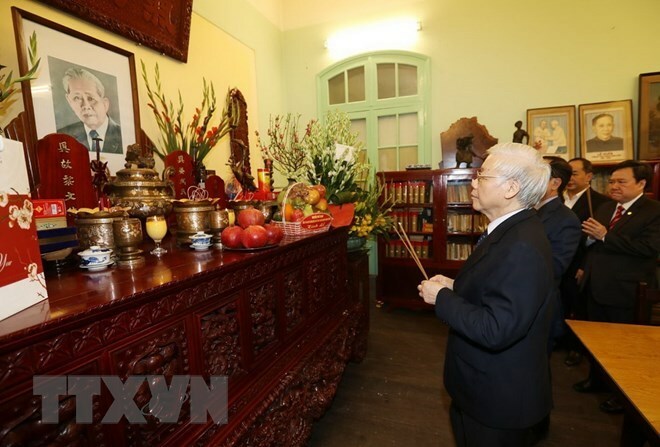 Party General Secretary and President Nguyen Phu Trong on February 2 offered incense to late General Secretaries Le Duan and Truong Chinh at their homes on the occasion of the coming traditional lunar New Year and the 89th founding anniversary of the Communist Party of Vietnam (February 3). Le Duan is described as an outstanding disciple of late President Ho Chi Minh and an exemplary communist combatant who left an invaluable legacy to Vietnam’s revolution, while Truong Chinh is credited for initiating the Doi moi (reform) policy which opened the country’s door to the world. 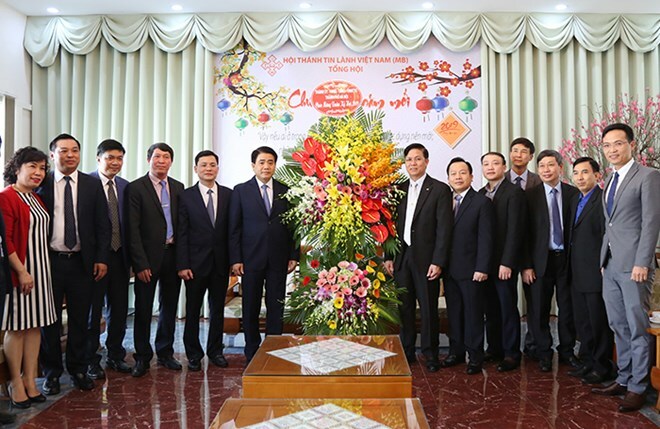 Chairman of the Hanoi municipal People’s Committee Nguyen Duc Chung visited the Evangelical Church of Vietnam (North) and the Hanoi Evangelical Church on February 1, ahead of the upcoming Lunar New Year (Tet) festival. He expressed his thanks to Protestant dignitaries and followers for partnering with the city in many activities over the past years, especially in health check-ups and treatment to the poor, contributing to the city’s fulfillment of its socio-economic targets. Last year, Hanoi met 20 socio-economic targets, including ensuring social welfares and improving local lives, Chung highlighted, adding the capital city was hailed as one of the top 10 dynamic cities by the James Lang Laselle at the World Economic Forum. Pastor Nguyen Huu Mac, head of the Evangelical Church of Vietnam (North), said Protestants are delighted at the local socio-economic achievements over the past years, adding that they will actively join national emulation campaigns launched by the authorities. The same day, Chung also paid visits to Ba Dinh district’s public security and Hanoi Zoo Co.,Ltd. The event was held at Suoi Tien Theme Park by the HCM City Export Processing and Industrial Zones Authority (HEPZA), gathering 600 disadvantaged workers who are unable to return home for Tet – a traditional occasion for family reunions. At the programme, municipal officials and workers had a meal with traditional Tet dishes together. Workers also received Tet gifts and the best wishes from the city’s administration. 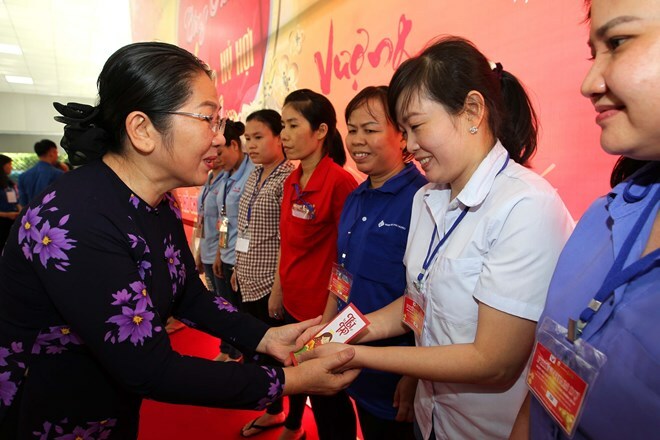 On the thresholds of Tet that falls in early February, HEPZA and local businesses have organised numerous activities to care for workers such as presenting 4,000 bus tickets to help them return home for Tet and over 151,000 gift packs to those with disadvantages. A variety of celebrations have also been held to help workers enjoy a happy Tet in the southern economic hub of Vietnam.